Play Chess Pieces Puzzle Online. "Chess Pieces Puzzle" is a free online knowledge level game, to sort the chess figures on the correct diagram of legal movements. Learn to play chess. Drag and drop chess pieces. Free online logic game. Logic learning game. Fun educational game, suitable for online lessons and interactive classes. 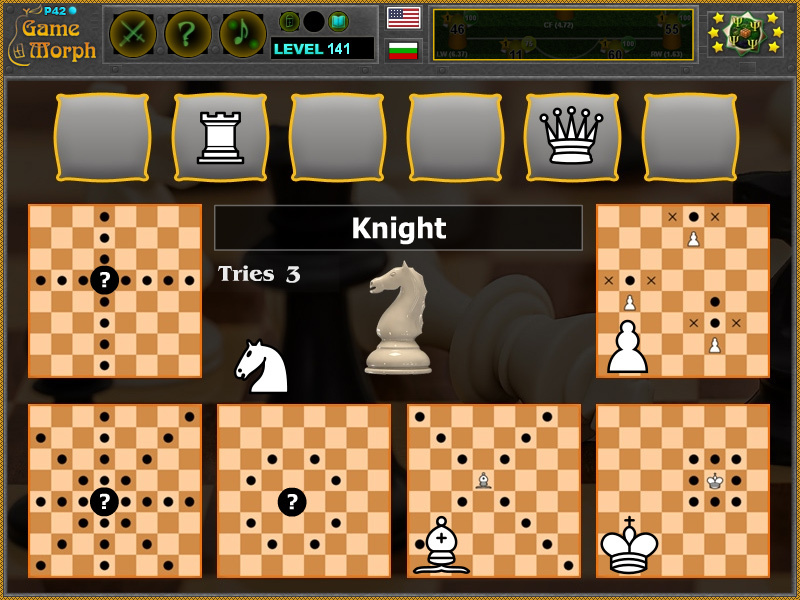 When ready try to play classic chess online. King - moves one square all directions. Queen - moves all square all directions. Rook - moves all square vertical and horizontal directions. Bishop - moves all square diagonal directions. Knight - moves to a square that is two squares away horizontally and one square vertically, or two squares vertically and one square horizontally, jumping over figures. Pawn - moves one square forward (from original position 2 squares). Game code by Ogo Bob. Pictures from Wikipedia. How to play Chess Pieces Puzzle. There are the 6 types of figures, from the classic chess game, at the top at the screen in white. Drag and drop them to the question mark of the correct diagram of movements for the selected figure. Sort all 6 figures correctly to win the game. 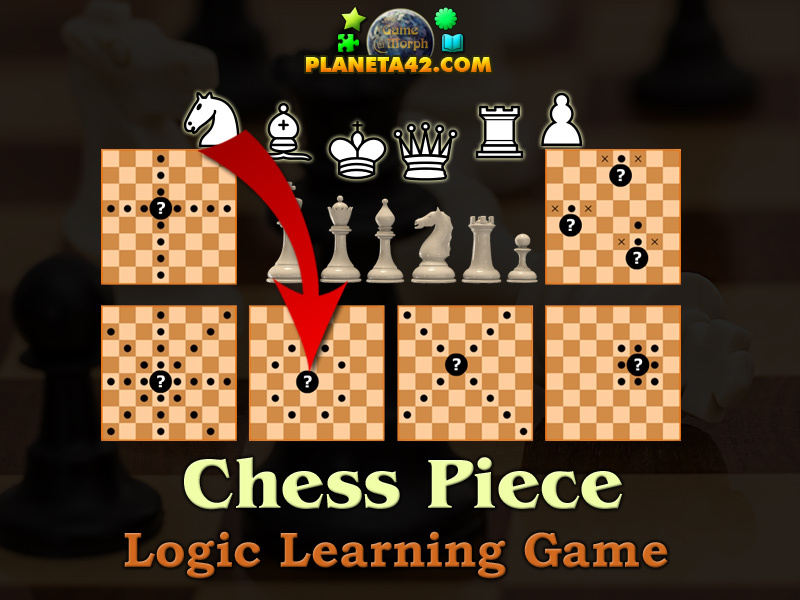 Know the movemet of the figures in chess game and get +1 Knowledge Level. Each chess piece has its own way of moving. In the diagrams, the dots mark the squares to which the piece can move if there are no intervening piece(s) of either color, except the knight, which leaps over any intervening pieces. A rook can move any number of squares along a rank or file, but cannot leap over other pieces. Along with the king, a rook is involved during the king's castling move. A bishop can move any number of squares diagonally, but cannot leap over other pieces. A knight moves to any of the closest squares that are not on the same rank, file, or diagonal. (Thus the move forms an "L"-shape: two squares vertically and one square horizontally, or two squares horizontally and one square vertically.) The knight is the only piece that can leap over other pieces. A pawn can move forward to the unoccupied square immediately in front of it on the same file, or on its first move it can advance two squares along the same file, provided both squares are unoccupied or the pawn can capture an opponent's piece on a square diagonally in front of it on an adjacent file, by moving to that square. A pawn has two special moves: the en passant capture and promotion. What are the legal movements of the bishop? What are the legal movements of the rook? What are the legal movements of the queen? What are the legal movements of the knight? What are the legal movements of the pawn? What are the legal movements of the king? Labels: Puzzles , Chess Games , Learning Games , Logic Games , Education Games , Free Online Games.